In so many grill installations you see these days, the grill or register is just screwed to the wall or ceiling and considered complete (not). For a professional looking installation and to really soften the look, here are a couple of simple tricks that you may find helpful. 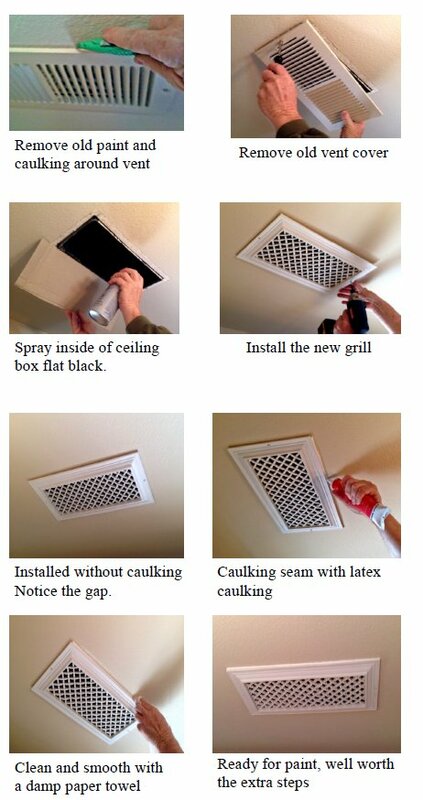 After removing the old grill, clean the inside of the ceiling or wall box with a damp cloth or household cleaner. Get yourself a rattle can of flat black spray paint. Spray the inside of the ceiling or floor box to darken the background. Don’t forget to mask around the box to prevent overspray. IF you are proficient with a spray can you can shield around the box with a piece of cardboard. To install the grill or register, screw the register to the ceiling or wall with the screws provided. Next is the important step that will set your installation apart from the others. Purchase a tube of painter’s latex caulking. Apply the caulking around the edge of the grill where the grill meets the wall. With a damp paper towel smooth out the seam until it blends smoothly. This process not only softens the look it also glues the grill to the wall or ceiling, hiding any unevenness in the ceiling or wall. This is the same process high end painter’s use on baseboards and door jambs. I hope you found this information useful. I promise it will really enhance the look of your installation.